When her mother passed away in 2009, Trude Lisagor discovered an old cardboard box containing personal essays written by her grandmother. Lisagor's grandmother had fled Nazi Germany in 1938 for the safety of the United States but the author had never met her personally - she only knew her as a smiling portrait hanging on her parents living room wall. 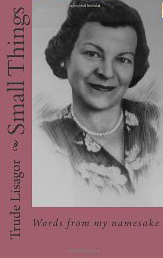 In Small Things: Words from my namesake (2010), Lisagor shares the essays she found, along with her own reflections. In addition to writing, Lisagor is also an artist who paints watercolors. She is married to author Michael Lisagor.